1. 320 hp Bulldozer (320 hp dozer) has high engine power, large output torque, low oil-consumption, reliable. 2. Hydraulic transmission, automatic speed regulation, gear shifting without stopping the machine. 3. Bulldozing working equipment can lift and tilt, adopting hydraulically servo controlling, which makes it easier to control. High-strength and corrosion-resistant blade possess high loading capacity and high wear-resistance. 4. 320 hp Bulldozer the new-style steering hydraulic-operated control valve makes it more convenient to control, reduces the labor intensity, and improves efficiency. 5. The novel hexagon cabin, a broader vision, better ventilation, better sealing effect. 7. Diverse optional device: U blade, straight angle blade, angle blade, cabin with air conditioner, driving shack, ROPS-FOPS device, three-gear ripper, single-gear ripper, heater, warm air aid, ether starting aid etc. 8. Many variants such as pipelayer. World Equipment has become a professional Chinese manufacturer of 320 hp crawler bulldozer. 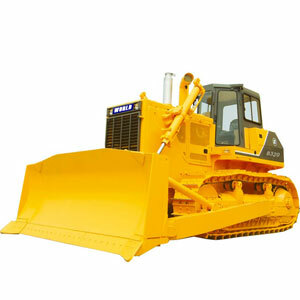 We provide the clients with three types of 320 hp bulldozer (320 hp dozer), that is B320Y-1, B320Y-2, B320Y-5. B320Y-1, B320Y-2 is equipped with Cummins NTA855-C360S10engine, B320Y-5 is equipped with Cummins QSx15 engine. The excellent mobility system is a guarantee of the products' praise for 320 hp bulldozer (320 hp dozer). We also keep developing and researching 320 hp bulldozer (320 hp dozer) products better adapted to the market to gain more acknowledgement from the clients. If you need 320 hp bulldozer (320 hp dozer), please contact us.